kim beller designs: mantra for the new year ~ copper cuff giveaway! i just LOVE giveaways!! this one is just in time for the new year! 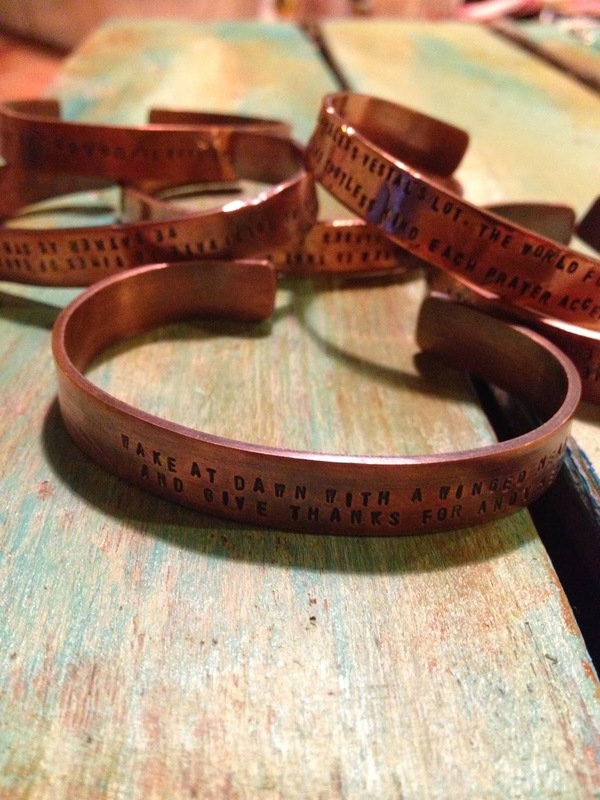 YOU COULD WIN a hand stamped copper cuff bracelet with any mantra or word you choose to keep near and dear to your heart this year. what would you have on your very own copper cuff bracelet that you could wear everyday as a reminder with your favorite mantra or word for the new year? "breathe" …. "to thine own self be true"….."stay in the moment"…. "my heart has wings"……the skies the limit :) you choose~ what best suits your needs at the moment. i wear mine everyday of the year….and i love it. mine says, "wake at dawn with a winged heart and give thanks for another day of loving"……join in the fun ….YOU could be the winner! all you have to do is link this blog post to your blog, instagram, twitter, or Facebook. oh, and pinterest! give me a shout out for the giveaway and you're in! leave a comment on my blog and let me know where you linked…..
for each spot that you link this blogpost you will be entered into the drawing!! link it to all five and your name goes in five times. drawing will be held on January 20, 2014.
this is the first day of MISTY MAWN'S online art class, so it will be a great day!! check out the new items in my etsy shop. i have put together some great art journaling/ collage kits! these are all hand picked by me, using some of my favorite pieces of vintage dictionary pages, sheet music, stamps , hand made books made by me, and much much more. check it out HERE!! and here….and here…..
everything in my shop is 15% off for the month of january for blog readers!!! (code is NEWYEARGIFT) now's the time to buy something fun for yourself or for a friend~~~~~ HAPPY NEW YEAR! I linked you on my Facebook page and PInterest thanks to Nina posting. Lovely blog to find. Happy New Year and good luck to all. I linked you on FB, Pinterest and Twitter. So glad you sent me a link! Linked you to my Pinterest ... these are just lovely! Linked on my Facebook page. Your jewelry is beautiful Kim. Happy New Year! What a lovely generous things to do!!! Please count me in! Lovely i posted on Pinterest. Hope I win. Great and generous way to start the new year. Love these bracelets, they're beautiful! this is awesome! consider yourself linked on my fb page! I've shared on FB, twitter, google+, Pinterest :) No doubt, I'll probably get in IG and link you up in a blogpost... but I haven't done those yet!